I have to be honest, when Lion Brand asked me to design a poncho for the new Touch of Alpaca yarn I had to pinch myself a little. This is simply the squishiest fiber and was so fun to work with. I knew immediately the kind of poncho I wanted to make. One I would want to live in! In 2003 I got to spend some time in various parts of Montana. What a really incredible place. Bozeman would have to be my fave of the spots I visited, maybe because I had some time to really take it all in while there. What I remember most was the view. Or views, plural, I should say. It seemed no matter which direction I looked there was a magnificent mountain view. This was before we all carried cameras in our phones so I rely on my memory for those views. And they are there. I can close my eyes and be whisked away to that wonderous space. I wanted to create a Poncho that reminded me of that place and time. I think the Montana Poncho does just that. It is classic and has a natural shape and beauty just like the surrounding Bozeman views. Effortless. Timeless. Lion Brand's new Touch of Alpaca is perfect for this design. 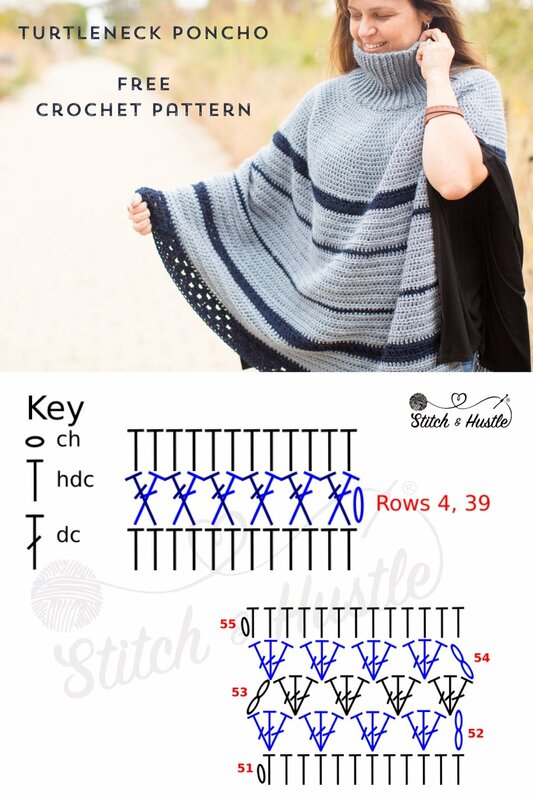 It has the right amount of stretch and give but still holds the shape and structure of the poncho. The Montana Poncho features a slit side to make it functional and keep your arms accessible. That was something I always wanted to remain true to my designs: function AND fashion. Perfect for a cup of coffee on the porch on a brisk morning or carrying my bag to market. The turtleneck has textured crochet ribbing to give you all the cozy feels. It works up easy and is perfect for markets and errands and I even wear it around the house as a sort of blanket shirt. This poncho is worked from the top down. First, the collar is crocheted sideways and seamed. The body of the poncho is worked down from the side of the collar. You can also buy the printable pdf pattern that is add free with schematic and charts in my Etsy shop here. Row 1: Fsc x24, Turn. Row 2: Ch 1, 23x sc in back loop only, Turn. Rows 3 – 96 (96, 104, 104): Ch 1, 23x sc in back loop only, Turn. Round 18: Ch 1 (does not act as st), * 24 hdc, [2 hdc in next st] *, repeat * to * all way around, then sl st to first hdc to complete Round - total for Round 208 hdc. Round 19: Ch 1 (does not act as st), * 25 hdc, [2 hdc in next st] *, repeat * to * all way around, then sl st to first hdc to complete Round - total for Round 216 hdc. Round 20: Ch 1 (does not act as st), * 26 hdc, [2 hdc in next st] *, repeat * to * all way around, then sl st to first hdc to complete Round - total for Round 224 hdc. Round 21: Ch 1 (does not act as st), * 27 hdc, [2 hdc in next st] *, repeat * to * all way around, then sl st to first hdc to complete Round - total for Round 232 hdc. Rows 1-2: Ch 1 (does not act as st), 176 (192, 216, 232) hdc all way across, Turn. Row 3: Ch 1 (does not act as st), 176 (192, 216, 232) hdc all way across, turn. Row 4: Ch 1 (does not act as st), skip first st, dc in next hdc, 1 dc in skipped st, crossing back in front of dc just made, *skip next hdc, 1 dc in skipped st, crossing back in front of dc just made * repeat * to * all way across row, turn. Row 5: Ch 1 (does not act as st), 176 (192, 216, 232) hdc all way across, turn. Row 6: Ch 1 (does not act as st), 176 (192, 216, 232) hdc all way across, turn. Row 7: Ch 1 (does not act as st), * 21 (23, 26, 28) hdc, [2 hdc in next st] *, repeat * to * all way across, turn – total for Row 184 (200, 224, 240) hdc. Row 8: Ch 1 (does not act as st), * 22 (24, 27, 28) hdc, [2 hdc in next st] *, repeat * to * all way across, turn – total for Row 192 (208, 232, 248) hdc. Rows 9-14: Ch 1 (does not act as st), 192 (208, 232, 248) hdc all way across, turn. Row 15: Ch 1 (does not act as st), 192 (208, 232, 248) hdc all way across, turn. Rows 16 - 28: Ch 1 (does not act as st), 192 (208, 232, 248) hdc all way across, turn. Row 29: Ch 1 (does not act as st), 192 (208, 232, 248) hdc all way across, turn. Rows 30 - 37: Ch 1 (does not act as st), 192 (208, 232, 248) hdc all way across, turn. Row 38: Ch 1 (does not act as st), 192 (208, 232, 248) hdc all way across, turn. Row 39: Ch 1 (does not act as st), skip first st, dc in next hdc, 1 dc in skipped st, crossing back in front of dc just made, *skip next hdc, 1 dc in skipped st, crossing back in front of dc just made * repeat * to * all way across row, Turn. Row 40: Ch 1 (does not act as st), 192 (208, 232, 248) hdc all way across, turn. Rows 41-50: Ch 1 (does not act as st), 192 (208, 232, 248) hdc all way across, turn. Row 52: Ch 2 (acts as first dc), skip 1 hdc, [3x dc] in next hdc, *skip 2 hdc, 3x dc] in next hdc * Repeat * to * across to end. Rows 53 - 54: Ch 2 (acts as first dc), skip 2 dc, *[3x dc] in between each dc cluster, skip 3 dc * Repeat across ending with 3 dc betweeen last dc cluster and beginning ch 2, turn. Row 55: Ch 1 (does not act as st), hdc in each st all way across – total for row 193 (211, 234, 250) hdc.